For the past four years I searched for the Top 5 financial institutions in five-year total return to shareholders because I grew weary of the persistent "get big or get out" mentality of many bankers and industry pundits. If their platitudes about scale and all that goes with it are correct, then the largest FIs should logically demonstrate better shareholder returns. Right? Not so over the four years I have been keeping track. BNCCORP celebrates its second straight year on this august list. Congratulations to them. A summary of the banks, their stories, and links to their website are below. 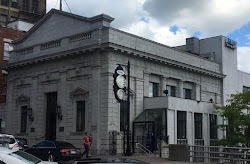 Independent Bank dates back to 1864 as the First National Bank of Iona. It's size today, at $2.4 billion in assets, is smaller than it was a decade ago. You might be able to see where this story is going. The bank was hammered with credit problems during the financial crisis, as Michigan's economy was hit pretty hard. Between 2008-11, the bank lost over $200 million, and its equity base was cut in half. But management went to work. Selling branches, shrinking the balance sheet, raising equity, and working out bad loans. At the height of its problems in 2011 over 9% of its assets were bad loans. Today that number is cut in half, and the equity has more than doubled. Those investors that jumped onboard at the end of 2010 were well rewarded. Their total return was greater than 1,000%. You read it right. In 2006, Fentura Financial, the holding company for the creatively named State Bank, had over $620 million in total assets, $51 million in total equity, an 0.85% ROA, and a book value per share of $24.08. Then the financial crisis hit. And yes, another Michigan bank. By 2011, total assets were cut in half, total equity was $14.7 million and book value per share was $6.27 after amassing $36.5 million of red ink 2007-11. Since those dire times, the bank has picked itself up, growing assets to $434 million and total equity to $30.8 million. Their year-to-date ROA was 0.95% and ROE was 13.3%. Not bad for a bank that was circling the toilet bowl. Investors that got in the stock at the end of 2010 were rewarded with an 862% total return. What a ride! BNCCORP, Inc., through its subsidiary BNC National Bank, offers community banking and wealth management services in Arizona, Minnesota, and North Dakota from 16 locations. It also conducts mortgage banking from 12 offices in Illinois, Kansas, Nebraska, Missouri, Minnesota, Arizona, and North Dakota. BNC suffered significant credit woes during 2008-09 which led to material losses in '09-10, and the decline in their tangible book value to $5.09/share at the end of 2010. Growth, supported by the oil boom in North Dakota's Bakken formation, and a robust mortgage refinance business resulted in a tangible book value per share at September 30th of $20.09... a significant recovery and turnaround story that landed BNC in our top 5 for the second straight year. Carolina Bank opened its doors in 1996 under the name Carolina Savings Bank. With nearly $690 million in total assets and eight branches, it is led by the same person since its founding, Bob Braswell. Like the other banks in the Top 5, Carolina took a little on the chin during the financial crisis, suffering small to moderate losses in 2009-10. But these were minor setbacks compared to others, and their financial performance is better than ever, recording a year-to-date ROA of 0.92% and ROE of 10.72%. Not bad for a bank that is less than $1 billion in assets. Citigroup, by comparison, had a 0.77% ROA and a 6.63% ROE for the same period. And they have $1.8 trillion in total assets. Trillion with a "T". Coastal is the $439 million in assets holding company of CBC National Bank, headquartered in Fernandina Beach, Florida. Which is interesting because Coastal is headquartered in Beaufort, South Carolina. But I digress. The Company's residential mortgage division, headquartered in Atlanta, has lending offices in Arizona, Florida, Georgia, Maryland, Michigan, Indiana, Illinois and Ohio. If I haven't confused you enough, they have an SBA division that originates loans in the Jacksonville, Ft. Myers, Tampa, and Vero Beach Florida markets, as well as Greensboro, NC and Beaufort. This crew gets around. Since mortgages were a great business to be in during the financial crisis *insert sarcasm*, they too suffered meaningful losses. But to get on the jfb Top 5, you have to execute a near perfect recovery. It looks like Coastal did so, and now sports a 1.18% ROA and a 14.83% ROE, delivering a 410% five-year total return to their shareholders. Well done! Here's how total return looks for you chart geeks, with the lower red, and flat line being the S&P 500 Bank Index. There you have it! The JFB all stars in top 5, five-year total return. The largest of the lot is $2.4 billion in total assets. No SIFI banks on the list. What about that economies of scale crowd? Hmm. 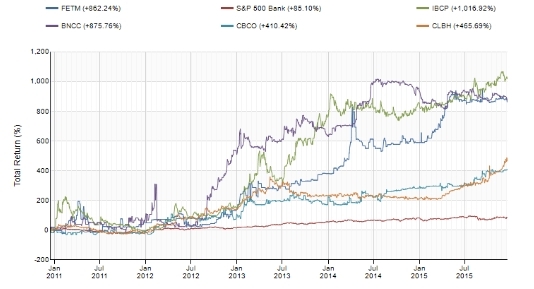 The flavor of this year's winners, as in last year, is recovery, with the possible exception of Carolina Bank, which held up well during the recession. Congratulations to all of the above that developed a specific strategy and is clearly executing well. Your shareholders have been rewarded! Jeff -- Another good post. I agree with your sentiment on scale not being the only criteria for success. Focus, niche and execution all play important roles. As you know, many community banks are "generational assets" where performance is not viewed in a five year window. Given 2011 was near the bottom of the trough, it would be interesting to see the same analysis over the last 10 years, which would cover a full economic cycle. I actually searched our database and the longest total return calculations performed were five year. Even static stock price points go back only five years. That would, unfortunately, require me to do manual searching. So I don't have the answer! Yes, it would be interesting to see. Future years will also be interesting as we see more top performing banks emerge that did not dig themselves out of a hole. As mentioned above, five years is probably the outside limit for boards giving management teams time to fully realize the fruit of their strategy. Jeff -- Totally concur with your five year approach on new management teams. Would be interested in your insights on attracting talent into community banking environment when current team is not cutting it. Finding them, compensating them, etc. Might be a good post one day. Thanks for the thoughtful response.